The happy-go-financially-devastated city worker wishes for some seaside escapism, but they’re forced to sit in an Argos sandpit, making wave noises with their spit. It is therefore time to address this issue, and inform people of one of Dorset’s best kept secrets. Sandbanks. Home to some of the finest coastline this island has to offer, it’s Britain’s own answer to Malibu, except with cracked smiles instead of crack whores. It lies afar from any porridge-skinned pensioner, desperate to turn themselves a more leathery beige. Sandbanks is then already a far-cry from its well-known neighbour of Bournemouth Beach, where at the height of summer, you’re forced to share the bodily fluids of the seven other families bundled on top of you in one big, sandy, factor forty mosh-pit. But it’s not just the lack of an overwhelming presence of the human species that works to Sandbanks’ favour, it also enjoys more sights and amenities. Alongside the charming beachfront cafés, hotels, and wine bars, it hosts a street that looks as if it were taken straight from the diary of Lisa Vanderpump. As I travelled through the maze of houses, it was yet another reminder of just how poor and feckless my existence was. Then, I was taken by surprise when the seaside serenity was cut short by a barrage of young German tourists that shot past me on bicycles. They were playing loud, angry, rap music, shouting at each other in their native tongue. For a brief moment, I thought that I’d been catapulted onto the set of a Mad Max film. Any minute, Tom Hardy could leap out from one of the nearby sun-houses, bind me with a mediocre performance, and headbutt me, before grunting off to an inevitably lacklustre sequel. Too much of English coastlines now operate on prohibition terms, with a ‘No Barbeques, No Ball Games, No Fun’ rule thrown in. I assume this is to cut down on crime and the excessive bin-burning dogma that we’ve all come to know and love from growing up in England. But Sandbanks is different. You can have a barbeque in the evening. You can watch the sun set over a glass of wine. You can play volleyball with nets provided free of charge. It’s a great place to be, and despite no nanny-state rules and regulations, Sandbanks is always spotless thanks to the diligent and respectful visitors of this fantastic coastline. 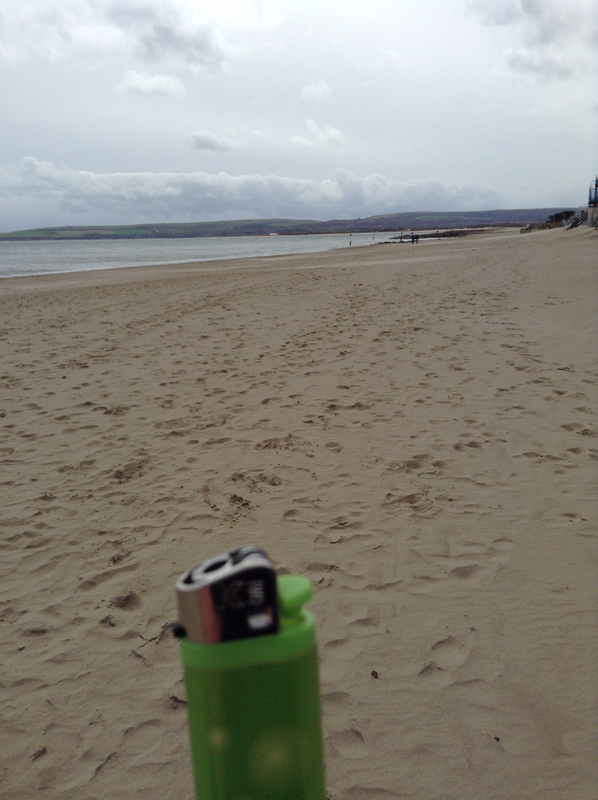 As the day was about to end, I picked a seaweed-green lighter and took my photo by the portrait beachfront of Sandbanks, only a short train ride away.